While on his way to propose to his girlfriend, songwriter Lee-hyung (CHA Tae-hyun) gets into a car accident and wakes up in a high school girl’s body. Subsequently, he experiences the lives of a divorcee detective, perpetually single high school teacher, and a granny. Quirky high school student nicknamed Scully (Kim Yoo-jung) figures out the mystery surrounding Lee-hyung’s body snatching and decides to help him get back to his own body. Can Lee-hyung go back to living out his own life and propose to his lover? Identity changing ain’t exactly a fresh concept in films, but I was surprised by the story was presented in an interesting way through the cinematography and storyline. “Because I Love You” is a mixture of “The Beauty Inside” and the Korean version of “4Love“, where different types of love through different age-groups were presented, except that this film nicely string the concept into a holistic story. Most of us know Cha Tae-hyun from My Sassy Girl, and when My New Sassy Girl came out last year, most people were disappointed. I used to think that he has that same character in all his films, and felt that he has already reached a plateau. Here, he carefully use the familiar nonchalant character the audience are familiar with and upped the game by putting this personality and behaviour into several other actors. So in this film, we follow Lee-hyung (Cha Tae-hyun) into the bodies of people in their teens, 30s, 50s and 70s, experiencing the different types of love that we face at various points in our lives as a single entity. With 4 different stories + 1 over-arching story that belonged to Lee-hyung, it was difficult to favour any one single story as each has it’s own unique selling point. When he was in the body of the teenage, he successfully put the audience into the shoes of the teenage girl and allow everyone to feel what the girl is going through (No spoilers!) When Lee-hyung became the unattractive obese teacher, things got a little unrealistic (at least for me). But it was still relatable to us as audience as it brought across the concern of our insecurities and imperfections. Those of us who may feel that we aren’t good enough, too short, too skinny/too fat, too unattractive. And despite all that makes us feel that we aren’t good enough, there is someone who sees something beautiful in you, and love you all the same. Similar to “Love Remembered” by Daniel Yam in 4Love (2016, Singapore), the arc on the golden age couple was one that hit the hardest. Perhaps because we all have parents and grandparents, but we have always felt their love through a veil, never really understanding that it’s not so different from our own. But in this scene we get to witness first hand the painful romance of a man who reconciles loving a woman with dementia and has forgotten him. If you are watching the film, and got lost halfway through, wondering where this film is leading you to, remember the title, “Because I Love You”. One of the best Valentine’s Day films that brings both laughter and tears to everyone! Aside from the hot weather, it was difficult to arrange all the actors’ schedule and get them together on the set. In one particular scene, the team barely scheduled everyone for the scene, got shooting permit from the city and convinced the locals and finally prepared everything for the shoot. But on the day of the shoot rain pour down, forcing them to cancel. They went back to square one and began preparing again and were able to lock it down towards the end of the principal shoot. “When I saw everyone captured on a single shot, it felt cathartic,” said director JOO. Bae Seong-woo acted in 8 films in 2016, which include Veteran, Beauty Inside and Inside Men. Together with Bae Seong-woo, they are the two busiest actors in Korean cinema right now. They work regardless of the genre and refuse to be type-casted. Veteran actor Sung Dong-il has starred in over 70 films and TV dramas since his debut in 1992. However, having acted for 25 years, he never had a kiss scene until now in this film. His previous kiss scene was with a dog in HEARTY PAWS. He was so stressed about this film that he felt more comfortable kissing a dog. 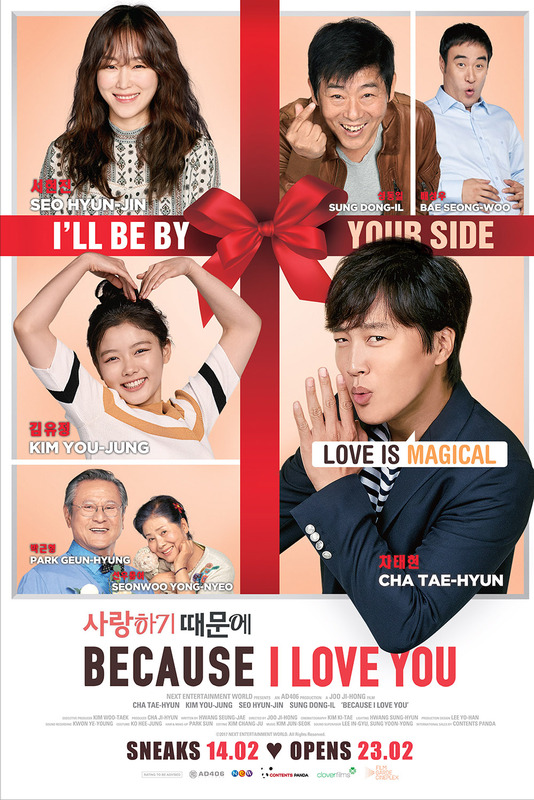 Because I Love You (사랑하기 때문에) is out on 23 February 2017 only at Filmgarde @ Bugis+. Sung Dong-Il is in so many historical Korean dramas I`ve watched like Moon Lovers: Scarlet Heart Ryeo, Legends of the Blue Sea and Hwarang. I came to know this movie because of Kim Yoo Jung. I might watch this soon. Nice. You were able to see this in advance! How is this shown? With subtitles? If ever I am in Singapore and watch Asian movies, do they have subtitles? I hope you don’t mind if I don’t read your review as I want to watch it for myself too! , but your reviews are always helpful. It is an interesting film to watch. The Korean actor did a great job. Indeed, playing a role of different character is not easy. I love the Korean films. Those are unique and really memorable to watch. Interesting!!! But I dunno how much I’ll relish this, coz when I saw this concept in Freaky Friday I was so impressed and then not so much in 17 again and then never watched any other movie in this concept!!! Identity changing is a really challenging role since you have to shift from different personas. It also a good learning experience seeing things from different perspective. What a high rating! Romances are not really my thing though so I am not sure if I will want to see this. But I will agree that plots involving the senior citizens will always tug at the tear ducts.